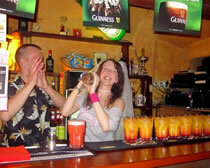 Our Cocktail Making session is a fun activity to start off your hen night in Prague. After meeting your group in the city centre, our English speaking guide leads you on a short walk through the Old Town to give you a flavour of the beauty of Prague. We soon reach the cocktail making venue, which is a friendly international bar popular with stag and hen parties, tourists and locals. On arrival, your cocktail barman greets you with a glass of Bohemia Sekt 'Czech Champagne' (it's surprisingly good!). While you enjoy the bubbly, your barman reveals his cocktail making secrets, then it's over to you to try your hand at it. Each member of your party takes their turn behind the bar to make two cocktails with him, which are theirs to drink afterwards. At the end, the barman gives his expert opinion on the results, presenting the winner of the best cocktail with a diploma. We also put out nachos and dips to accompany your cocktails. Before you head off, your guide, who is with you throughout, explains the nightlife in the city and the best places to go (for example, the largest club in Central Europe is just 5 minutes away). And to set you on your way, you get a free Party Pack (see below). The Cocktail Making session is a fun activity held in a bar you'll want to return to. It is suitable for all types of group, so stags and other parties are also welcome to book. £26/ €29.50/ 795 CZK per person. -English speaking guide throughout & cocktail barman. -Glass of Bohemia Sekt 'Czech Champagne'.